PRINCIPAL PRODUCTS AND EXPORTS: Agricultural: livestock, peanuts, rice, palm kernels, fish, millet, sorghum, corn, cassava, forestry Manufacturing: peanut, fish, and hide processing; beverages, woodworking, metalworking, clothing, agricultural machinery assembly Tourism is also a major source of income. GOVERNMENT: Independence from Great Britain, 1965. President elected by universal suffrage. Governing bodies: House of Assembly, elected, and Cabinet, appointed by president. The Gambia is the smallest independent state on the mainland of Africa. 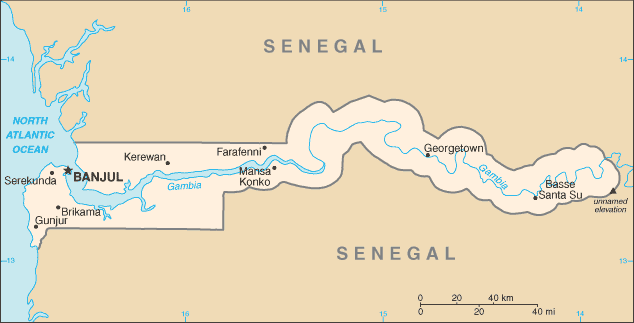 A long, narrow country located along the shores of the Gambia River, it is surrounded on three sides by SENEGAL. A former British colony, the Gambia established a successful democracy after gaining independence. In recent years tensions with Senegal, rebellions, and economic problems have caused periods of instability. The Gambia stretches inland from the Atlantic coast for about 200 miles. The country extends outward only about six miles on each side of the Gambia River. The river is one of the most easily navigated waterways in West Africa, with an excellent natural harbor near the nation’s capital of Banjul. Close to the Atlantic, the river is salty and mangrove swamps line the shores. Farther upriver the river water is fresh, and the land is suitable for growing rice. Still farther upriver, the banks climb to a savanna region, where grains such as millet and sorghum grow well. In the uppermost river area, hills and streams run through plains used for grazing cattle. The Gambia has long been a poor country. Its economy is based on subsistence farming and sales of peanuts—the main export crop. However, agricultural production has decreased since the 1960s, due to such factors as decreasing rainfall, overcultivation of the land, and the migration of young people from the villages to urban areas or other countries. Access to the Atlantic Ocean and inland waterways have made the Gambia a center for foreign imports. Cash earned from peanut exports is used to buy European manufactured goods, which Gambian merchants often sell to importers in Senegal and MALI. In recent years Gambians have developed a tourist industry with hotels on the coast and tourist camps upriver. In addition, the Abuko Nature Reserve, created to preserve endangered species, has become a tourist attraction. Gambians produce tie-dyed items, woodcarvings, silver objects, and other crafts to sell to foreign visitors. Most tourists come from northern Europe, but a few also come from the United States. International aid plays an important role in the Gambian economy. Agencies such as the United Nations Development Program, the World Bank, and the U.S. Agency for International Development provide not only money but also expert assistance in medicine, agriculture, veterinary science, and forestry. The quest for a route into the interior of Africa, the search for gold, and the SLAVE TRADE attracted various European powers to the Gambia after about 1500. After the British outlawed the slave trade in 1807, they established a settlement called Bathurst (present-day Banjul) at the mouth of the river. Their purpose was to prevent slave traders from entering or leaving the river. By the early 1900s Britain had a protectorate in the Gambia, which it ruled through tribal chiefs until the 1950s. Independence came in 1965. Sir Dawda Kairaba Jawara headed the new government for 29 years, first as prime minister and then as president. In July 1981, when Jawara was traveling overseas, revolutionary leader Kukoi Samba Sanyang tried to overthrow Jawara’s government. Sanyang was defeated with the help of troops from Senegal. As a result of their joint effort to put down the attempted coup, the Gambia and Senegal formed a confederation in 1982 called Senegambia. Once the crisis was over, however, Gambians began to resent the Senegalese troops stationed in their midst. Senegal eventually withdrew the troops, but Gambians still complained about Senegal’s restrictions on trade. The confederation was finally dissolved in 1989. Jawara’s government acquired a reputation as one of the successful democracies in Africa. The country had a number of political parties, an elected parliament, an independent court system, and a free press. Nevertheless, in 1994 a group led by army officer Yahya Jammeh accused the government of corruption and staged a coup that forced Jawara to leave the country. Jammeh’s government suspended the constitution, banned all political parties, and exercised strict control of the press. The government shifted its focus from civil rights to development, especially in the areas of health, education, and agriculture. A new constitution, favoring the military, was adopted in 1996. Since the 1994 coup, most of the aid from Europe, the United States, and Japan has been cut off. However, NIGERIA and LIBYA have sent shipments of rice. In addition, Jammeh has turned to Cuba, Iran, EGYPT, and Pakistan for aid.